Activities at Jaguar There are many activities that jaguar can undertake to insure that they meet their aims and objectives. Activities are specific things that jaguar are doing and can do so they meet their aims and objectives a lot quicker. In this piece of coursework I will talk about the activities that jaguar currently has in place so that they achieve their aims and objectives. The first aim that jaguar has it so meet production targets. There are many ways in which jaguar can ensure that they meet this aim. The first thing that they can do is to continuously update their lantern board. The lantern board is where all the information about the cars to produce is put up and the targets for the day are put up. There are many advantages for this. The first advantage that this has is that it makes the employee's job easier as it shows them what they need to achieve by the end of the day, by doing this it means that the production line will be continuous because all the employees will be doing the jobs that is required of them. If the production line is continuous it will lead to customer satisfaction as they will be getting their cars on time. The second advantage of having the lantern board up is that it keeps the employees motivated, the way in which it keeps them motivated is because it shows them a clear list of what they need to do, and this will make them determined to their job. ...read more. This will increase satisfaction as it will insure that the customers will think that Jaguar cares as they are doing everything they can to ensure that their customers are happy. Jaguar also packages their cars properly when they have been fully built. This is done because it ensures that the car is not damaged while the car is being transported from the factory to its destination. This will lead to customer satisfaction as it ensures that the cars that they receive will not be damaged. The second objective that Jaguar has is to maintain 100% production during running times. If Jaguar do this then it will be vital in helping them achieve their second aim which is to improve quality and customer satisfaction as it would mean that the quality is maintained. By having good quality cars it would lead to customer satisfaction. The third aim that Jaguar has put into place is to keep overall costs to a 2004 level. This is the year that Jaguar had spent the least in making their cars. If Jaguar keeps their costs to a minimum then it would mean that they would have a larger profit because of it. The first activity that Jaguar has it to use JIT (just in time system, this is when jaguar orders the parts when they are needed) if Jaguar use this then it would mean that they would make the cars just in time for them to be sent to the customers. ...read more. If this happens then it would lead to jaguars reputation increasing and this would lead to more people buying jaguars thus increasing their share in the UK luxury car market. The last objective that Jaguar has is to minimise XF model returns. There are many things that Jaguar can do to insure this. The first activity that they have is to use the railway links to ensure this, by ensuring that the cars are delivered to their customers on time then it would keep them happy and they would want to keep the cars. However if the cars were given late and were rushed to the customer then it may have resulted in the care being damaged. If this happens the car may be returned to Jaguar. The second thing that jaguar does is that they use kaizen encourages continuous improvement of the business; manufacturing process; reducing waste and finding better manufacturing techniques. This would help them minimise XF model returns as this motto will ensure that they make the cars to the best of their abilities. 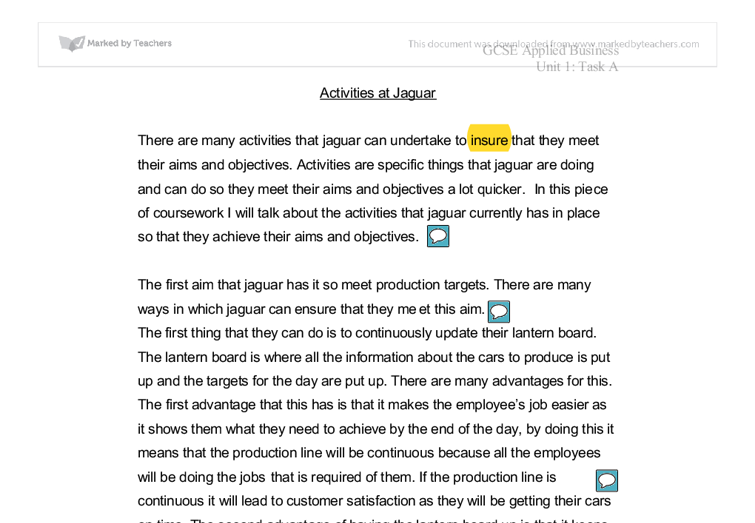 If jaguar continues to do these activities then it will help them achieve the specific aims and objectives. As we have seen all the aims and objectives are linked together as they all help to achieve one another. This means that if jaguar does all of the activities then it would help to achieve all of them. ?? ?? ?? ?? GCSE Applied Business Unit 1: Task A Heston Community School 13130 ...read more. This is a very well researched piece. The writer has confused some of the objectives and the actions that Jaguar are taking to achieve them but that is not a huge distraction. The essay would be improved by better structure and grouping of some of the main strands. For instance the kaizen is about improving production but occurs at various places through the essay. If waste becomes too much it will affect the long-term profitability of the business as too much money will be spent on waste and processes that don't work. It also encourages staff to waste more and becomes a vicious circle if not controlled. See screenshot below. o Another key thing that helps Tesco is it's e-commerce side of things. A lot of people now days buy online as they say it's "easier" and "less hassle". the box created so as to attract the customer to buy the product as it contains the stars from their favourite movies. In order to find out what a customer wants they will first have to do some market research, look at what is already being done so as to try and better that. individuals to deposit their capital into that country as they would be able to earn higher rates of interest on their capital. This would appreciate that country's currency. This in turn would make imports seem cheaper and exports more expensive, so some businesses might experience a fall in demand. the right people who are working in their business in order for it to be a huge success. The people at the Human Resource department have to work extremely hard in order to find the right people for the jobs by advertising the placements in local newspapers and then interviewing possible candidates for the job. Questions of Case Application Question 1. As the top managers of their company what type of issues might Bert and John have to deal with? Be as specific as possible, which management functions might be most important to them? Why? menu.towards the early 1950?s the restaurant was shut for alterations and changes in the menu and business.by 1963 their were 500 restaurants located in America.In 1867 Mcdonald?s became international with a restaurant being opened at Canada, Puerto.